How are you? (I’m hoping well!). I’m ok and i say ok because i feel like poo, i have the boring old winter flu/cold, whatever you want to call it. However, I needed to get this review out there, there’s just too much to talk about and the dragons blood set has been sat on my desk for a few days and i need to clear it out of the way without placing it back on the floor (again). Fortunately it’s not actually the blood of a dragon, that would not only be sad but dangerous job. Dragons blood is a range from nip and fab, i think they are the sister company of soap & glory but i feel like I have just heard that somewhere and relay the information to everyone who mentions them, rightly or wrongly. Dragons blood is supposedly ‘Thirst-quenching‘ and the main aim is to hydrate and plump your skin. If i’m totally honest i don’t really see what dragons blood has to do with hydration but it is so super catchy and the name alone made me buy it! The cleansing pads had been something i had seen sooooo many beauty bloggers try and review and they just screamed out at me to buy them every time i saw them. I was initially a bit miffed at the price but the pot contains 60 pads which is actually amazing, you rarely get more than 25 face wipes in a packet so it is pretty good value. The cleansing pads contain ‘hyaluronic acid’ (the acid bit does make me squirm), ‘salicylic acid‘and witch hazel. This combo is meant to hydrate, plump your skin and deeply cleanse pores with a quick whizz all over your face. I actually quite like the smell of the cleansing pads, i have read some people hating the smell but to me it smells cleansing and it doesn’t seem to be overwhelmed with perfume. After wiping the pad around my face is does seem to look refreshed and clean. You would think looking at the size of the pads that they wouldn’t be all that great at getting all over your face but i actually didn’t find the size an issue after using the cleansing pad. I will go in to this more below but i do feel like the whole ‘dragons blood’ selling technique is why a lot of people buy these products. 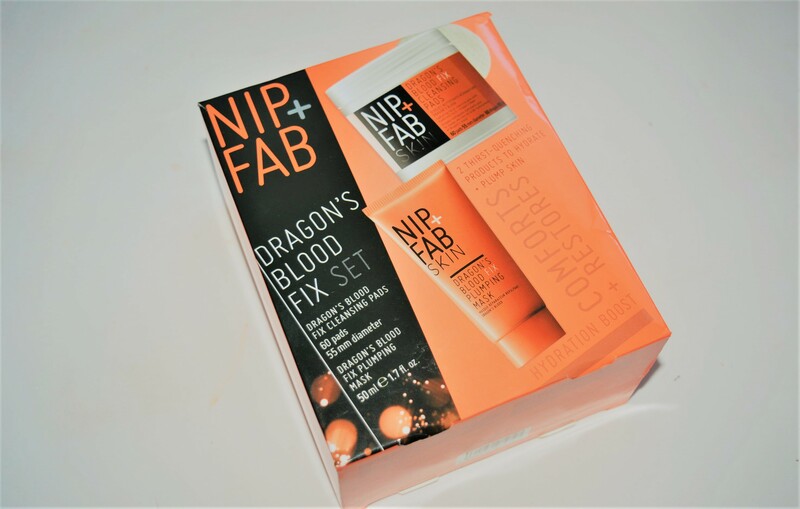 I have heard great things about nip & fab in the past but nothing that really swayed me to buy until i found the dragon’s blood skincare. I also want to comment on the size of the pads. I know i said it didn’t bother me but at first it did. I was concerned about how it would do my whole face and it did bother me before i actually used it. I tend to use both sides of the pad as to really use up the product but i can imagine a lot of people using two pads. I actually love the pads and will buy them again if i find them at an okay-ish price, they really cleanse your skin. The mask is supposedly meant to intensely hydrate your skin, plump the look of wrinkles, refine the skins appearance for a brighter, more youthful looking complexion. Once again it is said to contain hyaluronic acid (plump the skin), amino acid (to brighten the skin) and this time dragon’s blood comforts and restores skins hydration. I do look the idea of this plumping mask. You can apply and leave it on for 10 minutes or leave it on overnight for an intense overnight mask. The idea is great, the application is easy and feels nice on your skin. The first time i used it, I left it on for 10 minutes and when i rinsed it off, just like the pads my skin did look fresher and the next time I used it, i left it on overnight. My skin looked nice and much to my surprise it didn’t clog my pores. My first little issue with the mask is that it’s not red. I know, i know i know that i am being silly, i know people would hate sleeping with a red mask on their face but the whole ‘dragons blood’ theme just made me so dissapointed that the product wasn’t red. I had already read a few reviews and nobody seemed to mention this, I probably would of still bought it had I of known but i feel like it would of added to the idea of applying dragon blood to your skin. It would also be nice to see where you were applying the mask, considering it’s clear. My next problem is that it doesn’t peel or dry, it just sits on your skin like a moisturizer. I love this, i much prefer it but some people are under the impression that it’s a mini face mask, so i just wanted to add in that’s it’s clear! I have mentioned some negative things but i really do like how it makes my skin feel after using it. You can tell it’s a deep cleansing product and your skin does feel lovely after use, i just was a little disappointed with the mask not being a red or even a slightly colored liquid and the fact that the pads weren’t a little bigger. The fact it was called ‘dragon’s blood’ swayed me in to buying it. I wish i was more aware of what this actually entailed, i feel like i’m being completely stupid and everyone knows that dragons blood is magic or something. Overall the mask and the pads are great and i really would recommend them if you have a wrinkles or problematic skin. They are a little on the pricey side but they make your skin feel so pampered, just don’t buy it for the idea of ‘dragon’s blood’ it’s a great product without all of that. If you are interested I did find the two products at a really okay price on Amazon which i’ll leave below! I really hope you enjoyed this review, if you did please let me know in the comments below. Have a great day.